Replaced the departments 10 year old gear with $60,000 worth of all new turnout gear. New building is able to accomodate bigger trucks where the previous could not house the brand new truck the department recently purchased. New facility fitted with automatic lights, new push button doors, additional security cameras, and an updated alarm system. The previous facility was built in the 1970’s and had become too outdated to repair. Suffering cracked walls insufficient room, it was an overall hinderance to the department’s performance. The new facility also features a brand new shower area, a fully fitted kitchen, a restroom, and all the amenities of home. The City of Perdido is located near the City of Bay Minette and has experienced a consistent trend of growth in past years due in no small part to the communities it neighbors and supports. 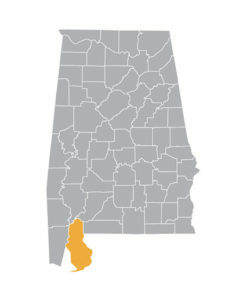 Next to Phillipsville and Dyas, Alabama, the greater Perdido area is a thriving one. 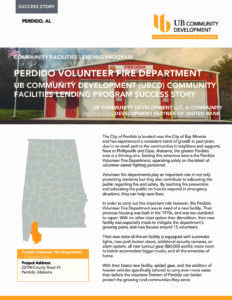 Serving this extensive area is the Perdido Volunteer Fire Department, operating solely on the talent of volunteer career fighting personnel. Volunteer fire departments play an important role in not only protecting residents but they also contribute to educating the public regarding fire and safety. By teaching fire prevention and educating the public on how to respond in emergency situations, they can help save lives. In order to carry out this important role however, the Perdido Volunteer Fire Department was in need of a new facility. Their previous housing was built in the 1970s, and was too outdated to repair. With no other clear option than demolition, their new facility was especially made to mitigate the department’s growing pains, and now houses around 15 volunteers. Their new state-of-the-art facility is equipped with automatic lights, new push button doors, additional security cameras, an alarm system, all new turnout gear ($60,000 worth), more room to better accomodate bigger trucks, and all the amenities of home. With their brand new facility, added gear, and the addition of heavier vehicles specifically tailored to carry even more water than before the volunteer firemen of Perdido can better protect the growing rural communities they serve.